Microservices describes how visibility into network traffic is the key to monitoring, managing and securing applications that are composed of large numbers of communicating services running in virtual machines or containers. However, there are limitations on the types of traffic that are logged, a 10-15 minute delay in accessing flow records, and costs associated with using VPC and storing the logs in CloudWatch (currently $0.50 per GB ingested, $0.03 per GB archived per month, and possible addition Data Transfer OUT charges). In addition, collecting basic host metrics at 1 minute granularity using CloudWatch is an additional $3.50 per instance per month. Lightweight, requiring minimal CPU and memory on EC2 instances. Efficient, export of extensive set of host metrics every 10-60 seconds (configurable). You can also make an RPM package (make rpm) so that the Host sFlow agent can be installed on additional EC2 instances without compiling. Note: The same configuration file can be used for all EC2 instances. The above steps are easily automated using Puppet, Chef, Ansible, etc. to deploy Host sFlow agents on all your EC2 instances. There are a variety of open source and commercial software packages listed on sFlow.org that can be used to analyze and the telemetry stream. The sFlow-RT analyzer has APIs that provide similar functionality to the Amazon VPC and CloudWatch APIs, but with sub-second response times. 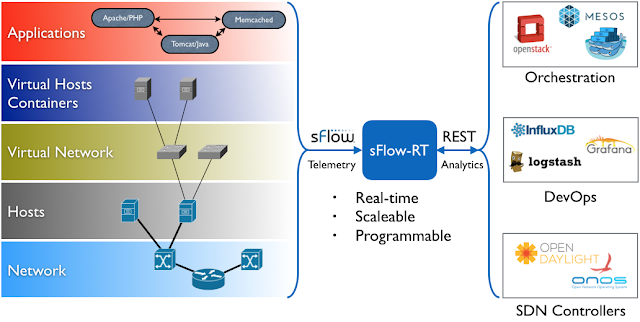 Industry standard sFlow is easily deployed, highly scaleable, and provides a low cost, low latency, alternative to Amazon VPC flow logging for gaining visibility into EC2 microservice deployments. Using sFlow for visibility allows a common monitoring technology to be used in public, private and hybrid cloud deployments, and to extend visibility into physical and virtual networks.